From Bandai. The Emperor of the universe has arrived! Frieza's iconic hover pod has been made into a awesome model kit in the FIgure-Rise Mechanics line! 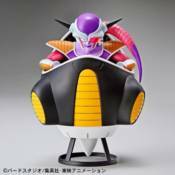 Made to scale with the Figure-Rise Standard Dragon Ball kits, this rare vehicle also includes a seated version of the evil villain Frieza's first form! Frieza can be freely moved from the hover pod to reveal the internal detail of the pod's controls.